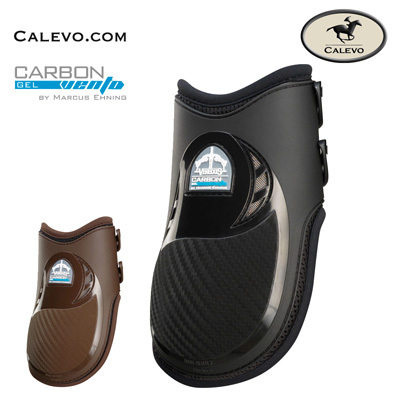 Carbon Gel VENTO is the first fetlock boot that guarantees double ventilation. The heat released from the horses leg passes through the microperforated neoprene layer and is then distributed in the 3D mesh ducted fabric. Fresh air enters through the air inlet as a result of the animals movement and directs the heat accumulated in the ducted fabric upwards to the outlet grille. Ventilation is therefore horizontal - from the inside outweards - and vertical - from the bottom upwards: an innovative and completely new technology. Fetlock protection is ensured by the carbon combined with a nitrex-gel shock absorber film. With anatomically-shaped shell and elastic quick-release tip. Available in the colors black and brown, in the sizes M, L.